Inspired by gowns worn during the Civil War period, this PDF pattern includes fully illustrated instructions and professionally drawn patterns to make two variations of the dress, as well as the pantaloons. It also includes detailed instructions on how to transform an ordinary straw hat into a Civil War era bonnet. It is rated intermediate, and recommended that you have basic sewing skills. View A has a collar that folds back from a contrasting pin-tucked yoke. The full sleeves have a cuff and a bell-shaped over-sleeve, typical of the period. It has bias contrast bands on the sleeves and skirt. View B has a collar that folds back from a contrast yoke with a pleat in the center. It has puff sleeves finished with a narrow cuff, and a contrasting bias band on the full skirt. 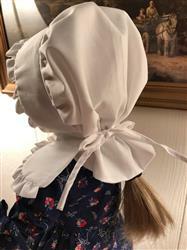 The bodice is embellished with buttons down the front and it has a matching bonnet. The bonnet is typical of the era. It starts out as an ordinary straw hat, which is cut to shape, and the edges bound. Also included are directions for making fabric roses and leaves for embellishment. To finish the outfit off, a pair of white pantaloons are included. They have a grow tuck and a lace edge, with an elastic casing at the waist. Recommended Fabrics: Medium weight cotton fabric. The instructions were easy and the dress fit well. 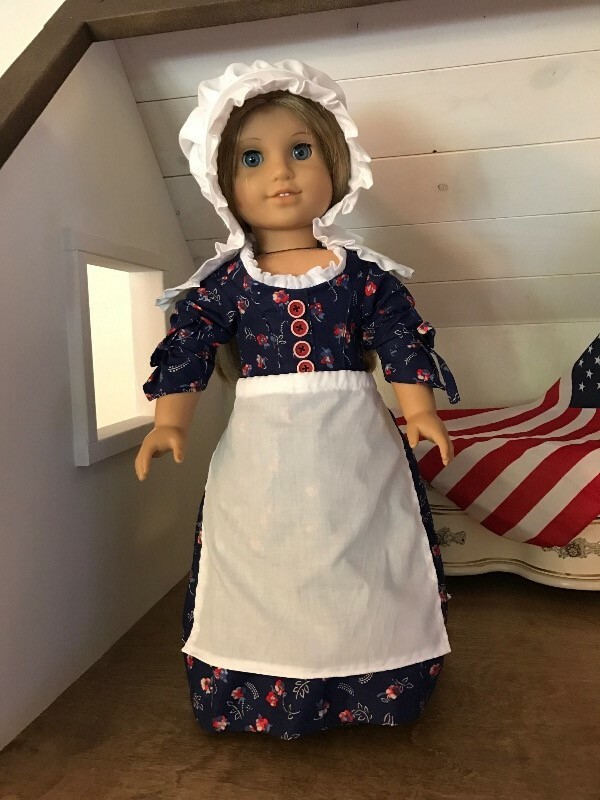 I loved the pattern for the Betsy Ross dress, apron and mobcap. The instructions were very detailed and the result was amazing. 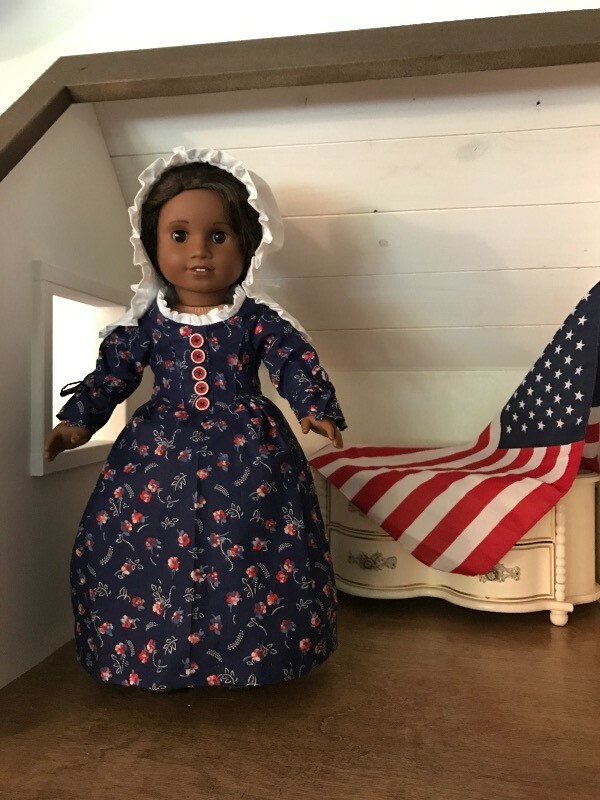 The dress fit American Girl Doll perfectly. I will be making this dress again. 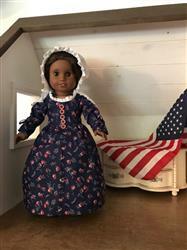 The pattern was perfect; directions were easy to follow and it fit the doll without any adjustments. I was a little worried after I read one of the reviews but There were no issues with the fit. This is an awesome pattern. This is an awesome pattern. 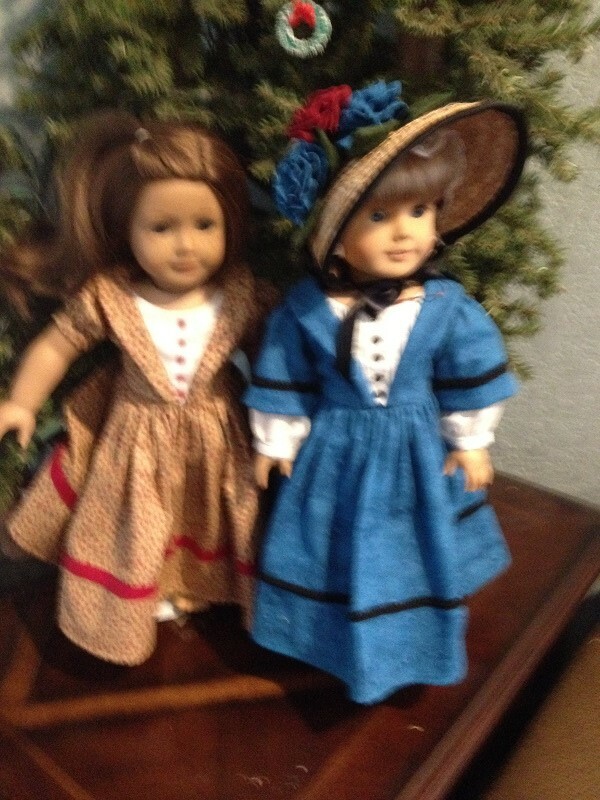 It was just what I was looking for, for my American Girl Marie Grace doll. The pattern was easy to make and came out beautifully. It fit very well. The collar was very interesting to put together. I have never had to make a collar that way before and I was very please with the way it came out. I really love this pattern and hope to make other dresses from it. Although this was a pretty design, it did not properly fit an 18'' doll and I had to add fabric to the waist. I sewed it again to make sure that I had not made a mistake that created this problem, but it still did not fit. Thanks for the review - we appreciate your feedback. Whenever someone mentions a fit issue, we always recommend a few things. First, feel free to contact the designer, their email address is in the pattern. Second, you may want to double check your printer settings are set to 100%. In Canada and the U.K. for example, the A4 paper size is a bit different than the U.S. Finally, feel free to connect with us via support@pixiefaire.com for additional help.